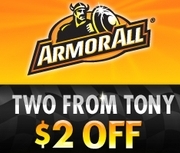 There is a new $2.00 coupon for Armor All Products. You can head over to the Armor All Facebook page and “Like” them so you can print the coupon. And don’t forget, you can use this with this Armor Wheel Protectant Rebate.